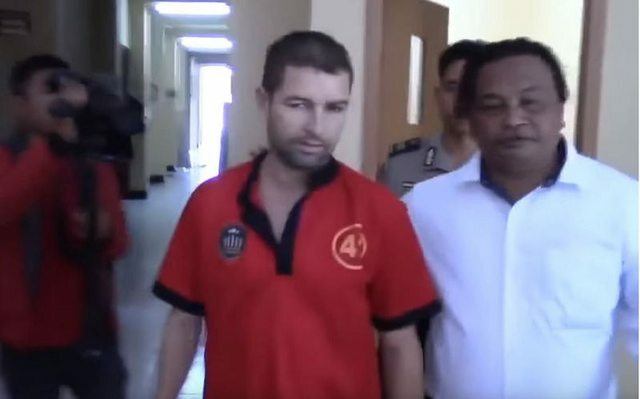 French drugs suspect escapes Indonesian jail using sarong. I vaguely remember reading there's no penalty or crime committed for a prison inmate escaping jail in Indonesia, and if that is the case, I guess if I was faced with possible execution I'd probably try my luck as well. An accused drug trafficker has busted out of an Indonesian prison by sawing through the bars and using a sarong to swing down to freedom, police said. A manhunt is under way for Frenchman Felix Dorfin after his daring escape from the second floor of a detention centre on Lombok island on Sunday local time. For the record, two of the four inmates who escaped Kerobokan in June 2017 are still at large (and will probably never be returned to Indonesia, especially the Malaysian one). Also, it is his second attempt at escaping, first one being when he was about to be arrested at Lombok Int'l airport. He even attempted suicide and declared that it would be better for him to be dead now than shot later. When you face such guy who clearly know what he has done and how bad it's gonna end up for him, one would thought that he would be carefully watched. Apparently not. Considering the former suicide attempt, it's for the least stupid from the cops to have leave in his cell a sarong and a curtain, plus a sharp object allowing him to saw the bar, which is what he has allegedly done. If you want to hang yourself, you've got pretty much anything which is needed. At least he has found a smarter way to use them. Indonesia is an amazing country, it is riskier to smuggle a kilo of narcotics than to blow up a few hundred people. Busted. At last. After over ten days on the run he has been caught after having been recognized and denounced by local people. He didn't resist his arrest but has allegedly tried to bribe officers so that the let them free. Didn't even make it off the Island.. disappointing.